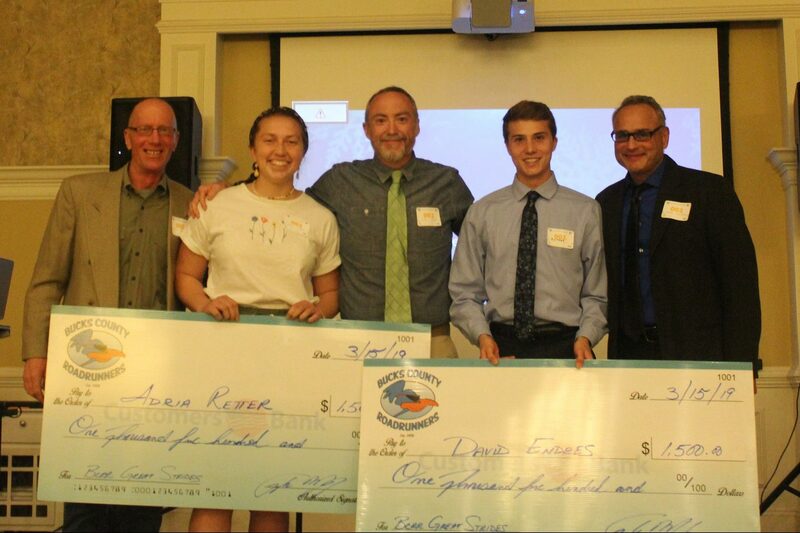 Friday night at the Winter Series Banquet the Great Strides Scholarship Winners were announced. We could not be more proud of this year’s honorees: David Endres and Adria Retter. The male and female students receiving this award will have participated in at least 3 years of high school track or cross country and submit a letter of recommendation from his or her coach detailing high school participation and contributions in either track and/or cross country. One letter of recommendation from a teacher, pastor, or other influential person in the student’s life is required. The letter should indicate the students’ character traits and how they have taken great strides to either overcome personal hardships and/or continually push forward to strive for excellence in their lives. A short essay of 500 words or less is required. This essay should tell us your future educational plans and your career objective. We would like to know how running has been integral in your ability to overcome personal adversity and/or push yourself to be your best in all aspects of your life. Lastly, describe what you are passionate about. Students must have all of their letters submitted by the Wednesday before Thanksgiving, which gives the committee enough time to read over the letters and discuss our selections. It is with gratitude and humility that I write this letter of recommendation for Adria Retter. These past three years I have had the pleasure of being both AP History instructor and Track and Field coach to Adria. When reflecting on those experiences I realize that I am able to see Adria excel in two very separate arenas of secondary school. Those experiences are proven to me that Adria may well be the most successful, yet humble, student I have ever had the good fortune to work with. The best way to describe Adria is that she has heart, meaning everything she does is to her utmost. Her work ethic and diligence is unrivaled and that is the reason I am overwhelming pleased to get this opportunity to whole-heartedly endorse her. Adria is the rare scholar-athlete that refuses to use athletic demands as an excuse in her academic responsibilities. Many of us juggle numerous commitments and demands in our lives; Adria succeeds at that endeavor with always a smile and a kind word along the way. In her personal letter, Adria wrote about an injury that she thought would end her high school throwing career. In November of my junior year, I dislocated my throwing shoulder. My surgeon diagnosed me with a torn labrum and predicted I would never throw again. Hearing those words lit a fire in my heart, and I refused to let his prediction come to fruition. After surgery, I began my path to recovery. I learned how to throw with my non-dominant hand so that I could still score points for our team. I dedicated my summer to learning how to spin in the discus throw. By the end of summer, I broke the school record, with a throw of 133’, and proved to both myself and my physician that my athletic career was far from over. She then explained how this incident crystallized her thinking about the impact hard work would have in all aspects of her life. This comeback story gave me confidence in my ability to persevere and reassurance that determination can produce results. Now, I see myself as an independent thinker with ability to speak up when I disagree or notice a solution to a problem. I think superiority can break potential relationships. For that reason, I do not tolerate superiority on the team; I carry the equipment and take my underclassmen out to dinner because I want to be both their captain and their confidant. 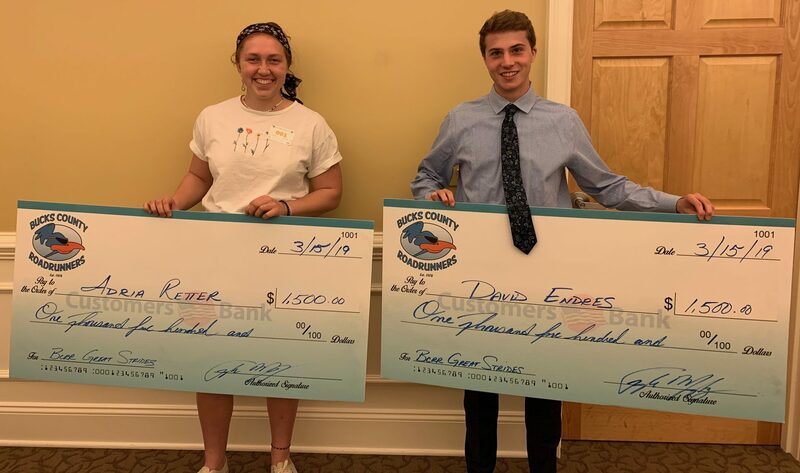 David is an exceptional young man, and it is without hesitation that I recommend him for the Bucks County Road Runners Great Strides Scholarship. David’s work ethic, maturity, and desire to achieve is one of the strongest I have ever seen, and I know he will flourish in anything he sets his mind to doing….It is rare to find someone with as many positive attributes as David and his relentless dedication and voracious pursuit of excellence is unparalleled. David’s list of accomplishments as a runner is lengthy, but there are a few moments worth highlighting. During the winter season of his junior year, David earned a sixth-place medal at states in the open 800, ran the opening leg of the state-qualifying Distance Medley Relay, and anchored a school record Sprint Medley Relay while taking home the team MVP. Then, in the spring, David was the fastest leg of the state medaling 4×800-meter relay; splitting a sub-1:55 second leg. As a coach, it was clear that David always put the team above himself and was willing to sacrifice his personal needs for that of his teammates. In his personal letter, David writes about his struggle with overcoming anxiety and embracing the challenge of being a leader in a mentally exhausting sport. A struggle that haunted me during my high school career is performance anxiety. From a young age, I was given a gift of natural running talent. I won multiple Archdiocese titles in the Catholic Youth Organization and even won the Cross Country Coaches Youth National Championship. The downside of this early success is that I expect and want myself to continue this level of achievement. During my high school cross country career, my anxiety to achieve greatness interfered with my performance. This peaked junior year of cross country at districts. While on the starting line, I had a panic attack and ultimately started the race hyperventilating. To say the least, I prevented my team from going to states due to my inability to contain my emotions. His raw honesty continued as he shared about how he worked to change his mindset by developing a mantra. Evidently, I needed to change my mindset in life to escape this continuous failure. For those that don’t know me, I strive to be the best in everything I do, which is unrealistic and mentally crippling. Last winter I changed this mindset by a little phrase I created: “all I can give is all that I got”. Immediately, the change was apparent through my mental health and results on the track. On the track I was running with the confidence I had at a younger age. Genuinely, this new mindset, brought on by running, turned my life around. The opportunities I have today, such as running in college are due to this change. Through running, I have learned to strive to become my own best self, and was taught how to deal with failure. As you can see both Adria and David have made great strides in their personal growth as scholars, athletes and leaders, which is why we believed that they were great examples of what our club believes in and our hope is to see the impact their lives will have on the future!!! Adria is planning on attending Messiah college in the fall and David has committed to the University of Cincinnati.